For more information about formats please download and read the documentation.pdf! Geometry: Each file contains only one object, all objects are polygonal based, built from quads and triangles. All objects have materials, textures, UVW coordinates, smoothing groups. Files and objects are logically named. 239 object: 263363 polygons, 302404 vertices. For more information about geometry please download and read the documentation.pdf! Materials: 23 standard materials. In max format all objects use the same multi/sub-object material. For more information about materials please download and read the documentation.pdf! For more information about textures please download and read the documentation.pdf! Animation: Single traffic-lights and intersections with traffic-lights are animated. For more information about animation please download and read the documentation.pdf! Elements are compatible with each others, and have the same base-size. Use the object’s pivot to align them. 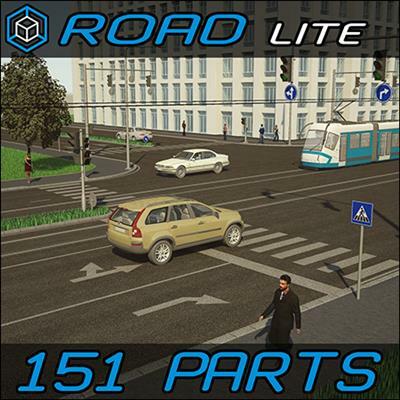 For more information about european road elements 3D pack please download and read the documentation.pdf!